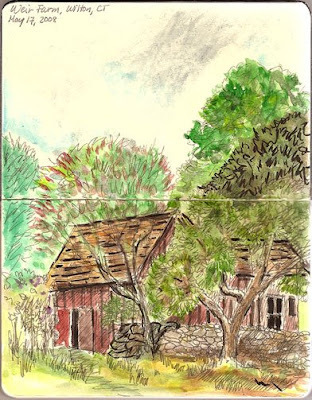 Since it was such a nice day yesterday, we decided to go to Weir Farm in Wilton, CT, after lunch. M would bike and I would sketch. It started off fine -- I decided to try out my brand-new red Lamy Safari extra-fine point fountain pen with Noodler's ink in Lexington Grey (hat tip to Nina Johansson) in a Moleskine sketchbook. But then I decided to try to color it in with my new Winsor & Newton watercolors, freshly bought from Cass on my trip to London. Bad idea. The watercolor beads on the Moleskine sketchbook surface, or worse, becomes gouachey and weird. I knew I shouldn't have done this -- I'd read countless posts on how the sketchbook pages don't really like w/c... but I guess I had to prove it for myself. And I did. If I had just left the line drawing alone, it would have been much better. And then I hated the w/c so much that I scribbled all over it with Pitt Artist pen in black. Ugh.